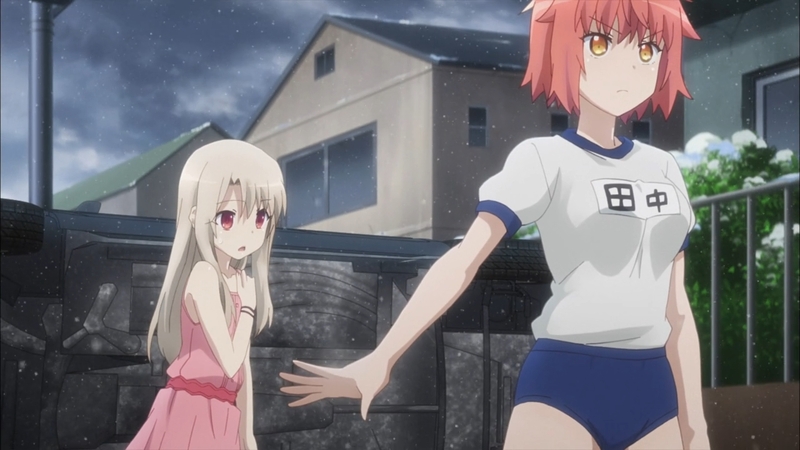 Moving steadily through this new world, Illya has found herself going from one bad situation to another. Last week ending being found by Beatrice while now they have run into the woman who is using Gil’s card. Not exactly the kind of exchange that I would like to go with. In the end though they have been found out again. Though it was kind of a given considering Illya let go of their stealth item to rush ahead. A dumb move on her part, but she is a kid at the end of the day. 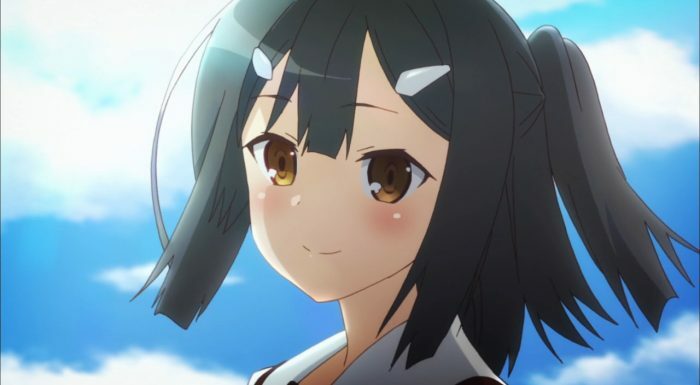 The chance that Miyu was there was more important than staying hidden. Although really I think she just freaked out at the possibility and rushed on ahead. It was a bad call, but I can’t fully blame her on that one. Sometimes you just want to save people. The situation is better than before, but still pretty dire. They do have Gil on their side which is a massive improvement from having him as an enemy. Obviously he was there because his card is in the possession of the Ainsworths, but it did mean he was willing to help out. And honestly without him there this situation would be beyond impossible to deal with. Not that it’s exactly safe, but they would already be captured or dead. Gil has some pretty handy tools at his disposal. A stealth item makes total sense to be stored away in the Gate of Babylon, just that he normally wouldn’t think much about taking it out of there. It’s too bad he didn’t have the Vimana stored away in his gate. 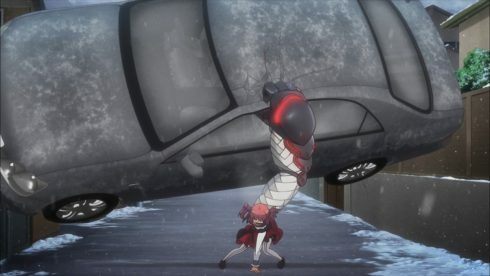 That being the crazy flying device he showed off in the last season and of course also in Fate/Zero. Certainly something that fast would be able to bust into the Ainsworth castle before they had time to even respond to it. The more important point is Gil noting that he doesn’t have all his treasures presently. Which was also a point made in the last arc where different items were divided between the reincarnated Gil and the card form of himself that didn’t reincarnate. 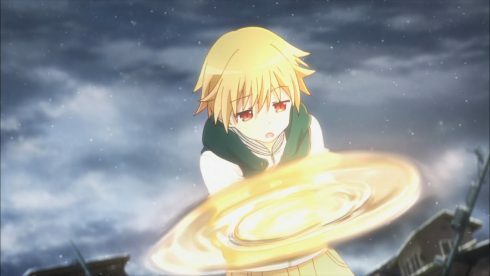 It does mean he’s probably not got the same level of firepower that we’re used to seeing from Gilgamesh, but frankly even partial amounts of his treasury still makes him one of the more powerful characters the main cast can count on right now. The tricky thing is that Gil is hardly that trustworthy. We’ve seen what this guy has done in various Fate-arcs. He’s got a dangerous mentality, but it is possible that this reincarnated version of him isn’t quite the same guy. Have to hope so since otherwise Illya won’t be safe around him. It’s a bit weird knowing what has happened in other storylines with these two, since right now we can see they don’t get along that badly. At least Gil knows how to play Illya so she will be cooperative. 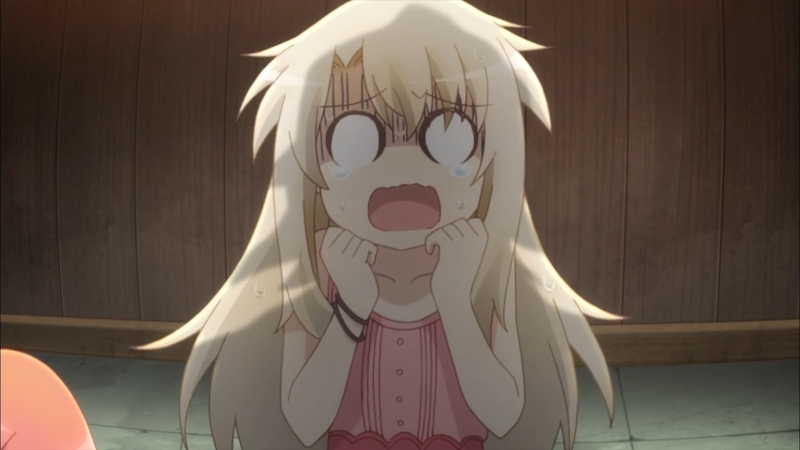 And sadly right now Illya doesn’t have any other choice but to rely on Gil. 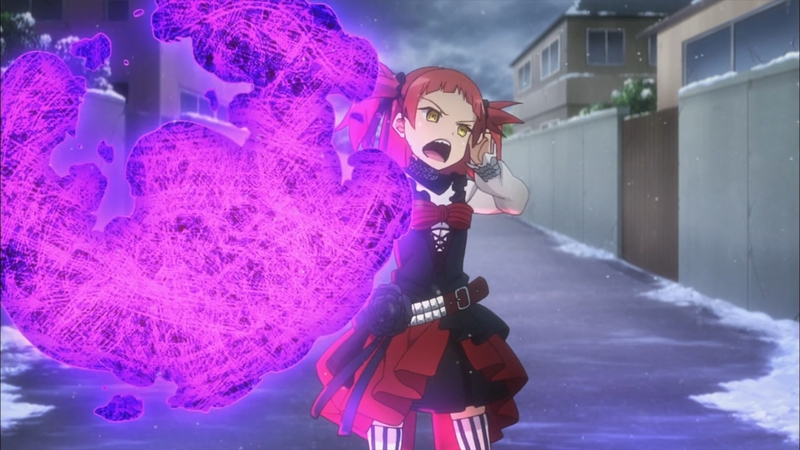 Tanaka has strange bursts of knowledge, but so far is pretty useless and Illya herself can’t fight without Ruby. They really have to rely on this guy to get by. The most interesting part of the episode though was running into Miyu’s brother, who should have a pretty obvious identity. 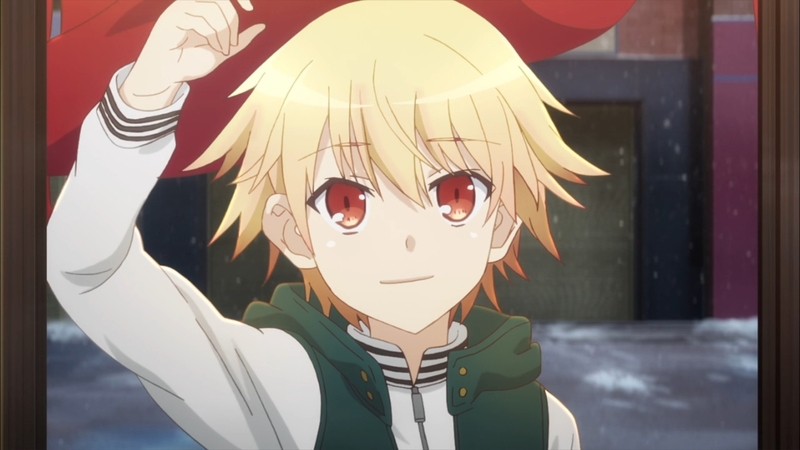 I mean Miyu did say that Illya’s brother “Shirou” looked like hers. Which would make sense since we’re talking about another world here and the same people could pop up in both. But, getting to the point it is clear Miyu’s brother has had a really bad time. He fought against these people and that in itself is incredible. We’ve seen the powers these guys have and if he got through that alive and only captured…that’s pretty good. The real tragedy though is how broken up he must have felt finding out Miyu had been brought back. Did everything a brother possibly could to save his sister and now he’s not in the position to help her. Now all he can do is ask a stranger (though admittedly her friend) to do what he isn’t in a position to do. It’d be nice if they could break him out, but it doesn’t seem like they have the time to think about that. What a crazy world though. Running into “that guy” running a ramen shop. 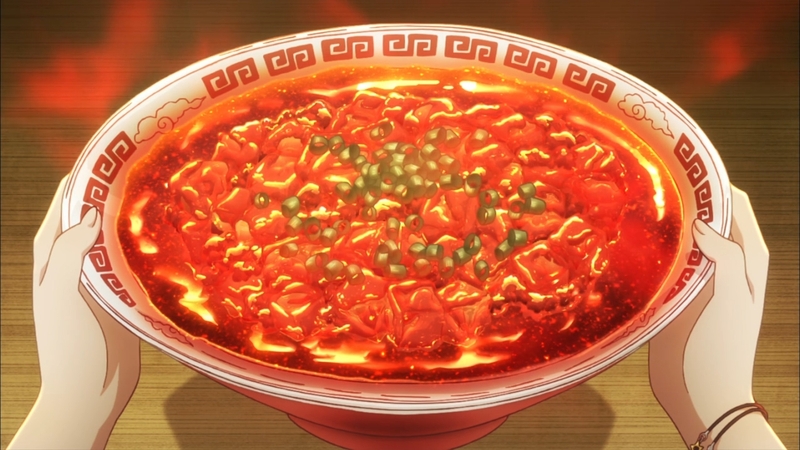 That is the most dangerous ramen shop of all time. Not only do you get extremely dangerous food, but you also will be killed if you don’t pay. Frankly I consider that a free sample! Illya didn’t order that meal! Luckily Gil is basically…stinking rich. He probably has enough gold, jewels, and cash stored away to pay for just about anything he’d like. What a dangerous guy though…Luckily he did get them something to eat and you can hardly rescue anyone on an empty stomach. The scary thing is that we still don’t know who Tanaka is. She has random memory loss and a desire to destroy the Ainsworth family. Though desire is maybe wrong…she just knows that is what she is supposed to do. 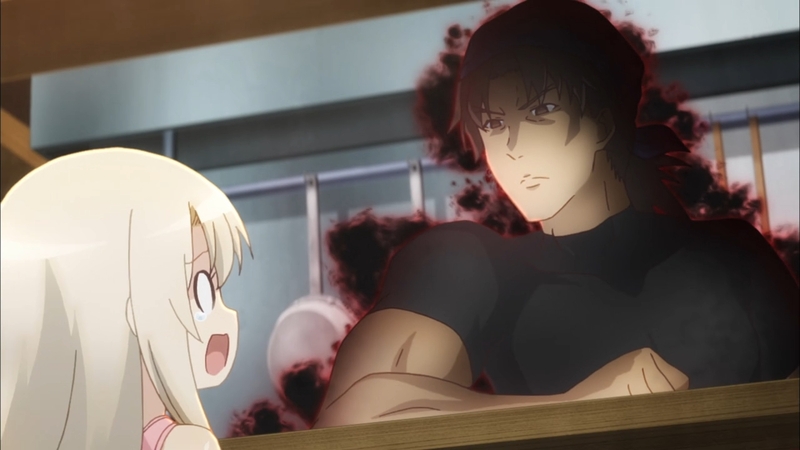 And I suppose the other scary thing is just how outgunned Illya is right now. She doesn’t have the ability to fight back and that Beatrice person has a card. We now know she is using a different Berserker card. 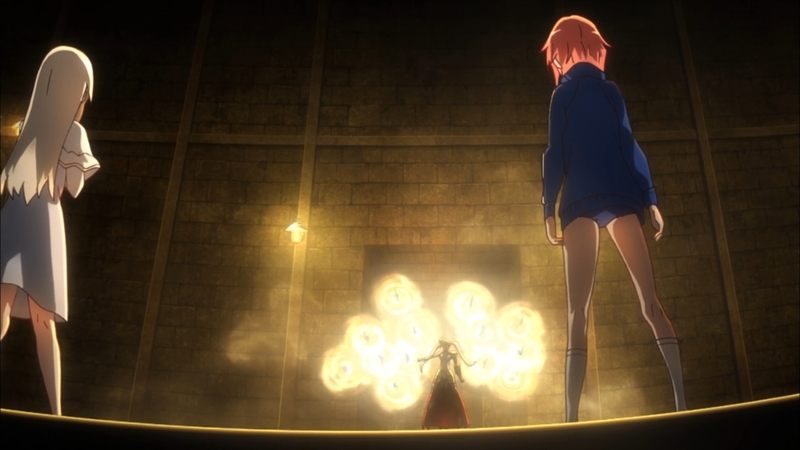 Also this Holy Grail War using cards doesn’t seem limited to just one servant per class. They could have untold numbers of cards in their possession that goes beyond the ones we’ve seen. That is a scary idea. I’m kind of bringing back something I used back for Baby Steps, which is my Manga Comparison section. 3rei is going to be an adaptation of something I already know and also an adaptation that looks like it will push the pace a bit. Unlike previous seasons where there wasn’t enough material, this season has a lot of material and if they want to get to certain stopping points…they might be pushing the pace as a result. 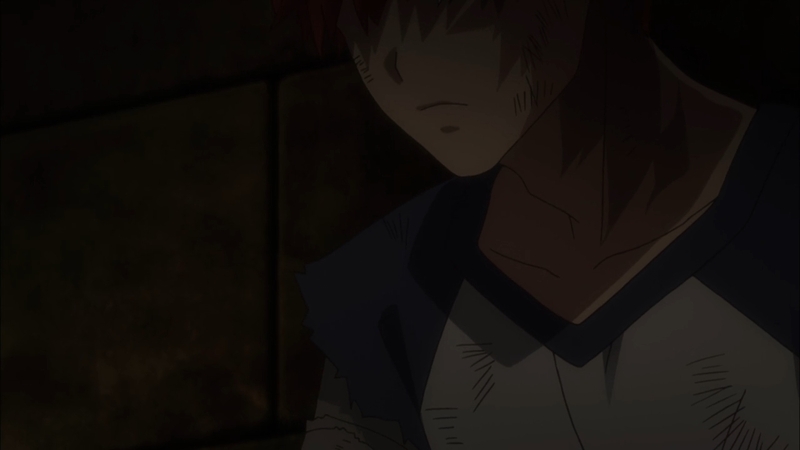 I will only be talking about what happened in this episode and what it connects to in the manga so there won’t be future spoilers in here. But, feel free to skip over if you want. We moved pretty well through the material this time around. Getting from the first half of chapter one (which had extra content in there and was a massive chapter) through chapter 3. The one thing I’ve noted so far is that they have omitted a few lines here and there. Mostly I think for the sake of time. There is just a bit less dialogue at times, but nothing I feel is critical to the story. The key moments have all still been in there. 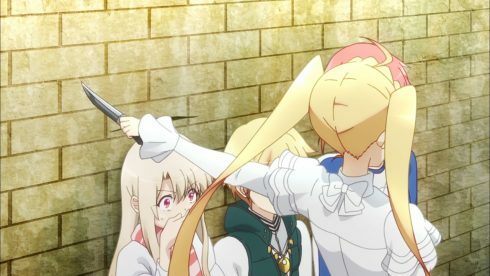 Illya nearly getting cut up by that Ainsworth character, the attack by Beatrice, etc. So far the differences really have just been a line here and there. 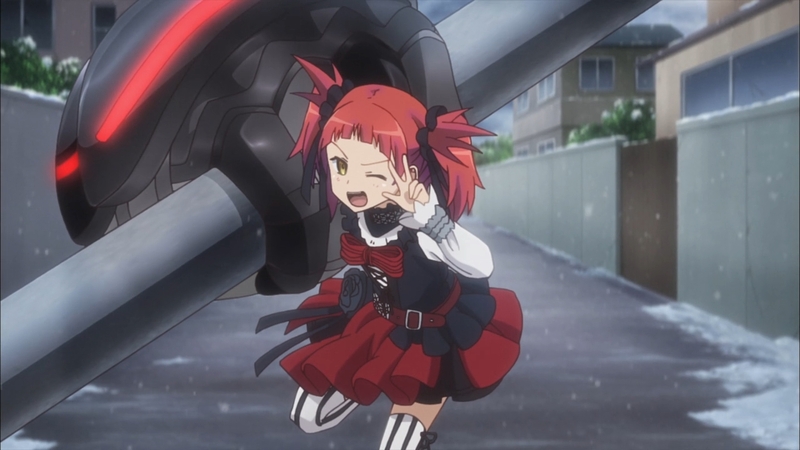 The attack by Beatrice was cut shorter though. Less moments of standing up against Beatrice, but the attack was called off in the same manner. I do hope they don’t go too far in order to get through the material. I don’t feel like the story is going too quickly, but losing out on the best moments would kind of defeat the point of adapting this. 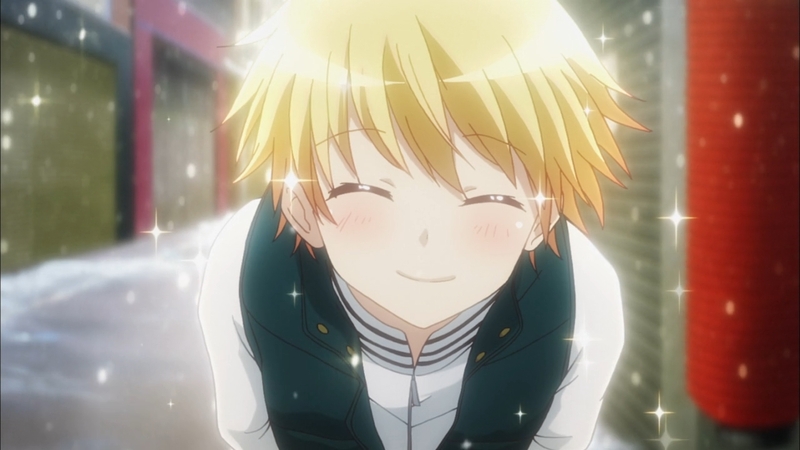 In the end it was another good episode. We’re getting into the story and seeing how uncertain the situation is right now. 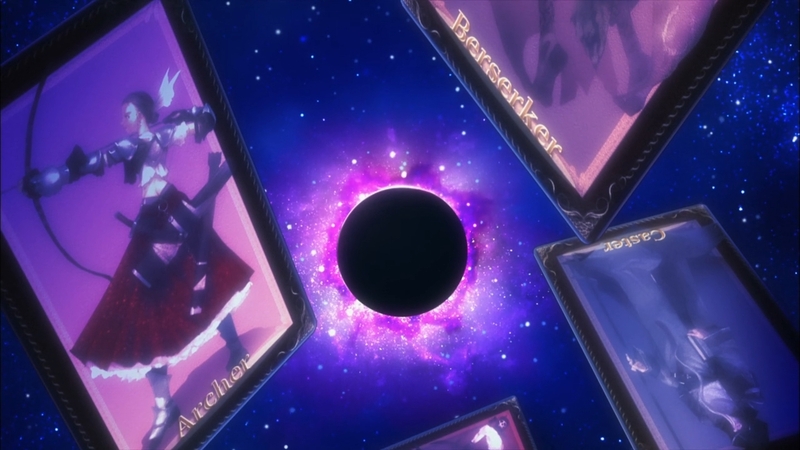 Illya is up against not just a random card or even herself, but rather a family that has the power to create and hide that kind of castle in the crater and create these cards. It’s a scary threat that they are facing here and right now she is next to helpless. Going to rely on Gil to take care of this immediate threat, but there is only so much that guy can do. Will cross my fingers and hope for the best there. 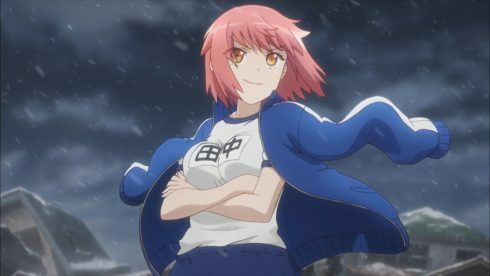 Tags: 3rei episode 2 blog, Fate/kaleid liner Prisma☆Illya 3rei! !, Fate/kaleid liner Prisma☆Illya 3rei!! 02, Fate/kaleid liner Prisma☆Illya 3rei!! 02 Review, Fate/kaleid liner Prisma☆Illya 3rei!! Anime, Fate/kaleid liner Prisma☆Illya 3rei!! Anime Blog, Fate/kaleid liner Prisma☆Illya 3rei!! Blog, Fate/kaleid liner Prisma☆Illya 3rei!! Episode 2, Fate/kaleid liner Prisma☆Illya 3rei!! Episode 2 Blog, Fate/kaleid liner Prisma☆Illya 3rei!! 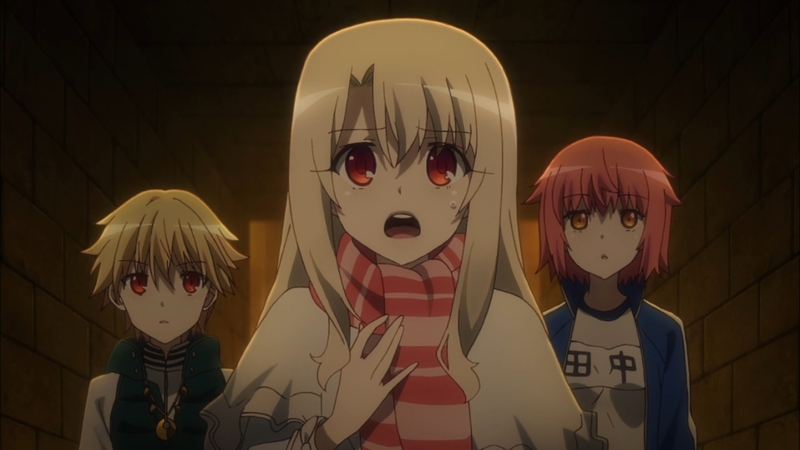 Episode 2 Review, Fate/kaleid liner Prisma☆Illya 3rei!! 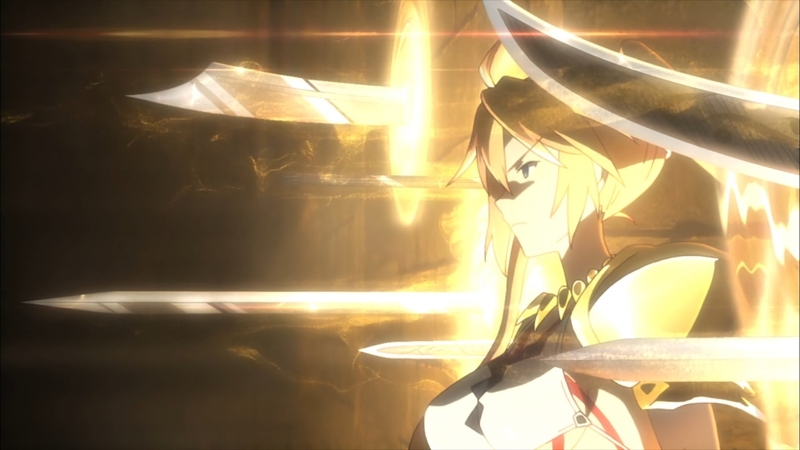 Screenshots, Fate/kaleid liner Prisma☆Illya Drei Episode 2 Blog, Fate/kaleid liner Prisma☆Illya Drei! !